With all the volatility in the equity market lately, it is only natural that investors are having a hard time figuring out what to do. That confusion is clearly starting to show up in surveys of sentiment like the weekly AAII poll. 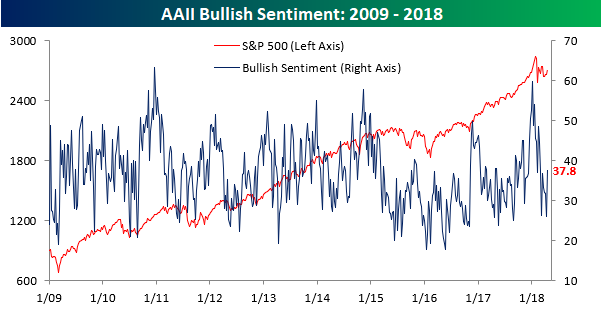 In last week’s update on sentiment, we noted that the percentage of bullish investors had dropped all the way down to 26%, which was the lowest level since last August. Well, in this week’s survey sentiment spiked back up to 37.8%, for an increase of 11.7 percentage points. That’s the largest one week increase since last September. Isn’t it amazing what a few up days for equities can do to sentiment? That said, we would note that these sort of sentiment shifts based solely on the day to day moves of the market isn’t particularly healthy. With the big spike higher in bullish sentiment, bearish sentiment tanked, falling from 42.75% down to 29.22%. 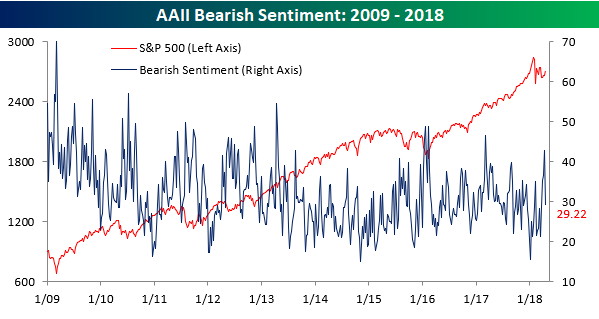 Besides a similar one week decline following the initial bounce in sentiment in February, the last time we saw a larger one-week decline in bullish sentiment was back in the first week of 2012!